Most Taupo rivers are still in very good condition and with another weekend just around the corner those who make the drive and get out on the rivers early will do well. Angling pressure has been fairly quiet in most places and all anglers have enjoyed great fishing on most rivers simply due to getting through pools which have not been hammered by 9am. 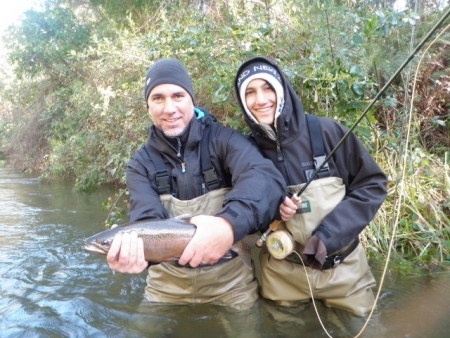 If you can give the weekends a miss and hit the river first thing on Monday you will really see the benefits with more relaxed fishing and better fish numbers. Rain is expected here over the weekend which should be enough to push more fish into all the rivers and I expect a steady movement of fish in the next few months. With spawning seasons getting later and later I expect fishing to be solid up till November which is a very different time frame looking back at 20 years ago. I keep guiding records of fish numbers etc and always have good results in the early summer which proves things are getting pushed back each and every year. Some of you may think that would mean a heap of slabby fish and in many cases it can work out that way but in the daily bags there some great looking silver bullets which are only in the river for one thing and that is spawning. 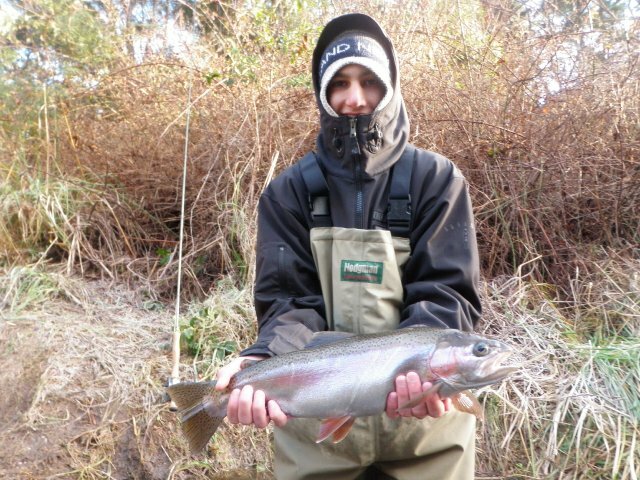 The upper river opens in December and I will be busy with raft trips which start at the very top of the river and get out at the Blue pool, anglers on these trips should expect a large percentage of Silver fish even up this high this late. I have been very lucky in the past week or so and have guided 6 out of 7 days with good results with all clients. Again a great half day experience has been just shooting down to the Hine. This river has surprised me very time I have been there it just keeps of producing good numbers of trout! Fishing has not been easy as the level is still very high in here but if you know where to look for the trout you will certainly find them in here. Try fishing the deeper slower holes with a side eady or somewhere for trout to lay up in the high conditions, this knowledge armed with a LOVE bug has provedÂ to be a good option.Â Fish in here have darkened up a little and a good rain or westerly wind should bring some fresh fish into the lower reaches. 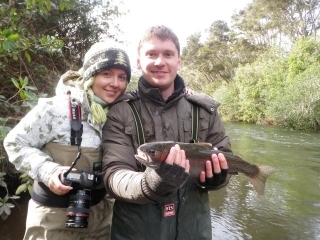 The Tongariro certainly has fish numbers in it and most anglers are finding them through out the day but again remember the key to successfulÂ angling and don’t spend too longÂ in one place if you are not catching too manyÂ . The braided area has produced fish most mornings and if you have a good long cast with effective line control you will always find one in the swirly water of the Honeypot. Spot X is also back and firing and first lines in here certainly has been producing some good fish. Glo bugs have been going very well early on in the piece but I would be changing to some sort of Caddis or small natural through out the day. Long leaders and fluro will help the cause but just fish the right rig to suit the conditions of the water you are fishing. The Witahanuie has had a good week and plenty of trout have passed the straight and made it into the main river which should give them some sort of cover from locals. Those who know the river well and can predict where these fish will lie have been doing very well with some lovely conditioned fish.Â Glo bugs are on the menu here and in most cases have worked very well if you are the first through the pool for the day. With westerly wind due and a bit more rain this river should also get another run of fish through and will be a hot place to fish over the weekend.